Dr. Jerry Wong obtained his MD degree from the University of Alberta, after which he worked for several years as a GP at a hospital-based practice in Maple Ridge, B.C. In 1991, he was introduced to the field of hair restoration surgery by Dr. Dorman – a hair transplant surgeon based in Vancouver. 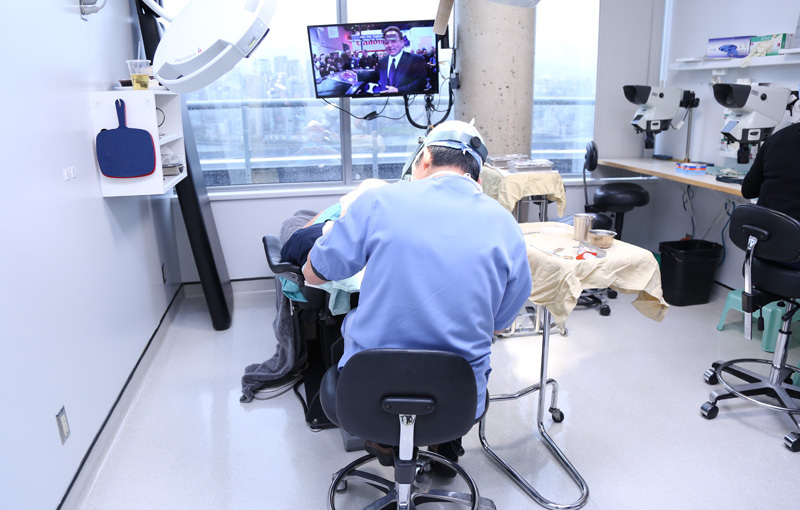 Dr. Wong was fascinated by the microsurgical aspect of the procedure. In 1992, Dr. Wong attended Dr. Mario Mazola’s hair transplant surgery school in Australia. In addition to micro-mini grafting, Dr. Wong acquired the skills necessary to perform scalp reductions, lifts and flap procedures. The ability to perform major scalp surgery is crucial when faced with difficult repair cases. To this day, Dr. Wong and Mazola have remained friends – attending conferences and occasionally sharing vacations together. The problem centred on the exit angle from the skin. Natural hair almost always exits the skin at an angle, while the transplanted hair sat perpendicular to the skin. In order to minimize scar formation, it was standard practice at the time to cut along Langer’s line – hence making sagittal slits in which to place the grafts. However, sagittal slits provided surgeons with little to no angle control. Dr. Wong reasoned that if the cuts were made perpendicular to the direction of the hair – while the blade handle was simultaneously angled forward – the slit would then sandwich the grafts and hold the transplanted hair shaft at whatever angle the operator chose. This simple twist of the blade enabled transplanted hair to be perfectly angled to match existing hair. As a result, transplanted hair could now blend seamlessly with existing hair – providing doctors with the means to create truly undetectable work. Dr. Wong first made use of the lateral slit in 1993 and presented his work at the ISHRS meeting in Barcelona in 1996. Early on there were a few doctors that recognized the benefits of the lateral slit technique, but the majority carried on using existing methods. In 1997, Dr. Wong and Dr. Hasson opened the Hasson and Wong Hair Transplant Clinic and devoted their time exclusively to hair restoration surgery. Hasson and Wong pioneered a number of technical advances in the field – including custom sized blades for recipient sites, depth control, dense packing, and scalp stretching exercises. When applied together, these techniques enabled the doctors to safely perform mega sessions of 5000+ grafts. A few years later at the ISHRS meeting in Vancouver, the doctors presented more than twenty live patients for other doctors to view. This instantly raised the bar and demonstrated just how good hair transplant surgery could be. This was also the meeting where the lateral slit technique was adopted as the new industry standard. Over the years, Dr. Wong has attended nearly all of the ISHRS meeting and has lectured at many of them – sharing the technology that was developed at the clinic. It was extremely gratifying to see the overall improvement in patients’ results, knowing that we at Hasson and Wong played such a major role in improving the quality of these results across the entire industry. Dr. Wong served as a diplomat for the American board of hair restoration surgery. He is also a founding member of the (AAHRS) Asian Association of hair Restoration Surgery. He was President of the AAHRS in 1994 and is still active on the board of directors. In 2011, Dr. Wong received the Golden Follicle Award from ISHRS for his clinical contributions to the field of hair restoration surgery. Dr. Wong feels very fortunate and grateful to work in this field. Over the years, he has been able to form long-lasting friendships with surgeons from all over the world. Dr. Wong also has a job he absolutely loves. A job that is stimulating, ever-changing, always seeking refinements and ways to improve.